This week back at work has been hard and a shock to the system after a couple of weeks off. The cold hasn't helped - having to leave the house in sub-zero temperatures and returning in the same, has not been a good experience. And did I mention, I'm back on the bike? Cycling in freezing temperatures is not pleasant either, with the cold giving me a headache by the time I get to work and my sluggish calf muscles even succumbing to cramp one evening. Cramp when trying to ride a bicycle is not to be recomended! One side effect of being gainfully employed is having less time to do things for me and hence having both less time to write here as well as having less to write about. 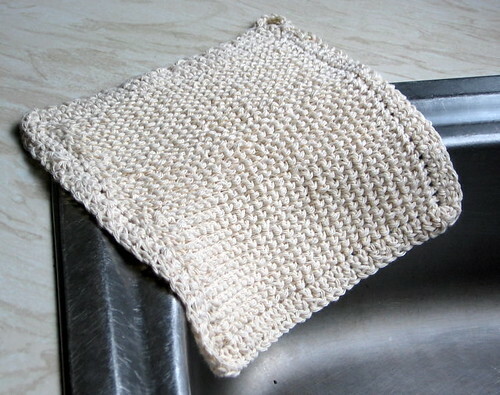 This is a new dishcloth for the kitchen, which I needed since the last one of the last batch I made is in a sorry state. The last dishcloth I made was knitted, this one is made using Tunisian Crochet. I simply cast on (I need to check if there is a proper technical term) 30 stitches and did Tunisian Purl Stitch (Tps) until I thought the cloth was big enough. I added a simple crochet border to finish off. The whole thing took me a couple of hours, which I thought wasn't bad since I'm pretty new to this whole TC thing. At the moment I'm still making swatches, but I'm trying to get my tension a little more even and experimenting to see what I can do about the curl. I want my crochet to lie flat. I'm also thinking that what I may do is start to crochet larger swatches and keep the swatches as I make them. I'm thinking that when I have enough, I could sew or crochet them together to make a sampler blanket. This was my excuse to buy more yarn on Saturday when we made a very quick visit into town as we were expecting a visitor in the form of Dave's dad. I had a list and tackled it efficiently rather than ambling around town allowing Dave to browse at will. Dave complained that he kept losing me, as the instant he took his eyes off me I was gone. Our hurried trek around Coventry yesterday revealed how many empty units are there now and just how many of the smaller retailers, along with bigger chains are gone. Some have vanished in the past few weeks! Land of Leather went today, its not good.